As a rule, you won't see me quote from press releases, but this one from Cate La Farge Summers at Alice Marshall Public Relations in NYC was just too good and too on-target. Deal: “Muy Sabrosa” package at the Inn on the Alameda adds not only value but culinary spice to a stay in this kooky, lovely city. Breakdown: Package rates begin at $376 for a two-night stay and include a two-and-a-half hour cooking demo and lunch at the Santa Fe School of Cooking, a $40 gift certificate to Mucho Gusto (a cozy Mexican café next to the Inn), plus breakfast and afternoon port and cheese daily. Why Should I Leave My Air-Conditioned House? : To get lost in the flowers at the Georgia O’Keeffe Museum. Plus, Santa Fe averages 325 days a year of blue skies and sun, and is one of only nine cities in the world to be designated a “Creative City” by UNESCO. Fine Print: Package is available for Sunday-Tuesday and Wednesday- Friday stays during specific dates through the year. Book: www.innonthealameda.com for more details, 888-984-2121 to book. Tip: A lot of the Santa Fe is up and down but this area of downtown is pretty much travel on the level. See what I mean about to the point? Here's another that is ultra flat and fab. Deal: Parrot Cay’s ‘4 for 3’ and ‘7 for 5’ offers have just been extended through December 20, 2009. Summer rates go down, so you can stay longer for even less. Breakdown: Nightly rates begin at $575 this summer (rather than $775 in the winter), which means two can stay four nights and pay $1,725. That rate includes daily breakfast, return airport transfers, and complimentary Pilates and yoga. Why Should I Leave My Air-Conditioned House? : Because this resort is like rehab for the soul. The private island spans 1,000 acres, with white sand beaches and turquoise water in every direction. You can bone-fish, consult with the Ayurvedic doctor, or float in the pool all day. Fine Print: You have to play it cool when swimming next to Bruce Willis and his newly-betrothed. Trick roper Kevin Fitzpatrick demonstrates his skills. Obviously, there are hills in the Hill Country but plan your trip right to travel on the level by letting horsepower - four-legged or -wheeled - do the climbing for you. Bandera, population 967, where guest ranching began, is a great place to start traveling the Hill Country and Dixie Dude Ranch, one of the first, is the place to stay. The ranch itself is on the level and your mount does the work in the hills. Even getting on is easy with a mounting "platform" that puts you above the horse. In our group were two adults who had never been near, much less on, a horse and while they discovered places they didn't know could hurt, loved the experience. We headed nose to tail up into the hills and plateaued out over a lovely vista of rolling hills and native flora. World Champion all-around trick roper Kevin Fitzpatrick entertained us with some fancy looping until it was time for the family-style dinner. That's when we realized how famous Dixie Dude is - there were guests from Spain, Germany, England, Minnesota and Florida. Cabin accommodations are rustic but spacious, well appointed and comfortable. Tip: Don't miss Wednesday steak night at the 11th Street Cowboy Bar in Bandera. Locals bring their meat of choice and use the bar's many outside grills and large lineup of condiments to cook and season it perfectly. You can buy beverages plus sides from salad to dessert. Then the band kicks up and everyone dances, especially the locals and eventually the visitors. Fun, fun time and just the thing to loosen up those new muscles you discovered in the saddle. Between rides spend an hour or so in the charming Frontier Times Museum. Get Director Jane Graham to tell you all about it and you won't want to leave. Everything has a story and she knows them. ROME - See it on the level! Oh, those hills, about seven too many for Leveler comfort, but don't let that stop you from traveling to and enjoying the Eternal City. Yes, everything you want to see will be at the top of one hill and at the bottom of another, so pace yourself. Between rigorous sightseeing, take advantage of some of the world's best people watching by lingering over a beverage in an outdoor cafe. 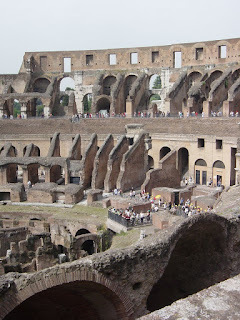 Tip: The Coliseum is a must-see so do it the easy way. Look to the left of where you buy your tickets. There's an elevator there and it takes you up to a very good vantage point from which you can walk around to imagine what it must have been like during Roman times. The many piazzas are blissfully level, albeit cobblestoned, each has a church worth a look-see, most have a fountain and a cafe for relaxing. Sure, throw a coin over your shoulder into the Fontana di Trevi - if you can muscle your way through the crowds to its edge - but don't waste too much time there. After all, the myth that if you do so you will return to Rome came from the movie, Three Coins in the Fountain. Tip: The Spanish Steps and Via Veneto are not to be missed. After shopping the windows along the Veneto, something cool at the Hassler atop the steps will bring a touch of elegant civility. As you approach the steps, veer off to the left; you'll find an elevator there. Avid traveler and sometimes Leveler Diane Till told us about this but Leveler Joan Monsky reminded us that the elevator stops running early, around 8 p.m. Except for its very healthy dunes, Sapelo Island off of Georgia's southern coast, is flat. That's the good news for traveling levelers. The less than good news is that there aren't a lot of what most travelers consider amenities - specifically restaurants and bathrooms. Tip: Among the nicest facilities are those at South Beach, where you access one of the most beautiful beaches you'll ever see - rolling dunes, sweeping expanse of sand, undeveloped and open vistas. If you see three other people it's a crowded day. There is a sweetness and a deep sadness overhanging this barrier island, the sweetness from its towering yet enveloping oak trees to the basic, with the earth lifestyle of its long-time inhabitants. The sadness comes from them, too, what their ancestors endured, having been brought here as slaves, struggling to buy their land following the Civil War and being pushed off of all but a small portion to make the island a private reserve for the R. J. Reynolds family. You can tour the Reynolds mansion on Wednesday mornings with an advance reservation and groups can stay there, but the former stables and barns now house the University of Georgia's Marine Institute. Sapelo is reached by a 30-minute ferry ride from Meridian, GA., and a reserved tour is necessary to see it unless you're fortunate enough, as I was, to be brought over by an island property owner. Tours of the mansion and island or lighthouse and island can be arranged at www.gastateparks.org/info/sapelo, but to get a special feel for the island and its history, I'd go with Spirit of Sapelo's wagon and bus tours or www.gacoast.com/geecheetours.html. The three-hour-long Spirit excursions are run by the Bailey family whose matriarch, Cornelia Walker Bailey, is the last of the generation born, reared and educated on Sapelo. Tip: Her book, God, Dr. Buzzard and the Bolito Man, is a wonderful read. Order and read it before you come; wish I had. Sapelo's People by William S. McFeely will give you an insight into slavery on the island. Canopied roads, intriguing boutiques, excellent restaurants, challenging golf courses, an expansive equestrian center, beaches, marshes and a hunka history make St. Simons Island, GA., a fun destination. And, traveling levelers, it's about as flat as land can get. General James Oglethorpe established Fort Frederica in 1736 to protect the Georgia territory he had claimed for England. At the time, the French and especially the Spanish were contending for control of the area. The town of Frederica grew and thrived adjacent to the fort until 1742 when British troops from Darien and Frederica roundly defeated Spanish invaders from Florida at the Battle of Bloody Marsh. Ironically, the battle that decided British supremacy in the colonies eliminated the need for the fort and both it and the town were disbanded. Their remains are now protected by the Park Service at Fort Frederica National Monument. The Feb. 18 founding of Frederica town is celebrated annually with reenactments and demonstrations. Irony continued as this year, reenactors from Castillo de San Marcos in St. Augustine, Florida, Spain's East coast bastion, joined the British contingent and the Clann Non Con Highlanders from Darien in recreating their era for visitors. Tip: Fans of the late author Eugenia Price, who based many of her novels here, will want to seek out some of her other landmarks such as Christ Church, Frederica, where the Wesley brothers, fathers of Methodism in America, first preached under one of the enveloping oak trees. The daily St. Simons Trolley tour, recommended by the author, hits 35 points of interest on the island. The 1794 frigate U.S.S. Constitution owes its nickname, "Old Ironsides," to the rock-hard live oak timbers cut and milled on the island's north end at Cannon's Point. St. Simons Island timbers were also used in constructing the Brooklyn Bridge. You'll be glad they left some standing. Tip: Don't miss the Tree Spirits, weathered faces carved into trees - some say they represent sailors aboard St. Simons oak built ships who died at sea. Look for them at Demere Road at Skylane Drive; at the Wine &Cheese Cellar in Redfern Village off Frederica Road and at 3305 Frederica Road. 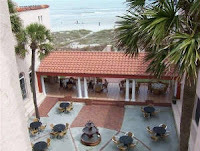 Accommodations range from B&Bs, motels, rental cottages and condos to the King and Prince, a Historic Hotel of America; Sea Palms golf and tennis resort and The Lodge (Mobile 5-star, AAA Five Diamond, Golf Digest. No. 1 in US) and The Cloister (a Robb Report 100 Ultimate Escape, Travel & Leisure 500 Greatest Hotels in the World, plus Mobile and AAA top rating), on Sea Island, a brief causeway away. Tip: Locals flock to the 4th of May Cafe on the corner of Ocean and Mallory Street in the Village for reasonably priced, ample and delicious food for breakfast, lunch and dinner. The Butter Pecan French Toast, $5.95. won't blow your budget but it will blow the diet - worth it. The Golden Isles area - Brunswick, St. Simons Island, Little St. Simons Island, Sea Island and Jekyll Island - offer enough to keep you traveling happily - and flatly! - occupied for a week or more. Located on the south Georgia coast, they are 65 miles north of Jacksonville, FL; 274 miles from Atlanta; 75 miles south of Savannah and 186 miles from Charleston, S. C.
I'll blog more about them in coming days. Canes make you look old. Hiking sticks, however, make you look athletic. Both aid balance when traveling over unfamiliar terrain, so why look old? If you've ever tried a hiking/walking stick over uneven ground, you know how much more secure and balanced you feel with one, or two. If your travel is by car, go wild with a unique, hand-crafted wooden job. The trick is to pick one that fits your grip and height without being too heavy or cumbersome. Tip: Physical therapists at Brooks Rehabilitation Center and the Jacksonville Orthopedic Institute recommend moving the stick simultaneously with your weaker side. Fliers are limited to the retractable variety. Sports shops or outfitters usually stock several models in a rainbow of colors. These are adjustable, so height and grip are not an issue, but security is. Test a stick for how much weight you can put on it before the twisted-in-place-adjusters loosen. If traveling to extreme climates, ask how cold and heat affect those closures and make sure you can return it if it doesn't perform as promised. Tip: Measure your luggage before shopping for a retractable stick. I haven't been able to find a stick that fits in anything smaller than a 26-inch suitcase, so if you find one, please let us know the brand. Panama City Beach goes to extremes. You can almost touch the free-roaming deer at one end of the 27-mile-long strip and at the other you find hi-rise condos and a new take on shopping/entertainment centers. In between - a sampling of ocean-side tourist attractions over the past 60 years. St. Andrews State Recreation Area, on the east end, is the gem where the deer roam. Well-managed facilities bring 21st century comfort to a day spent in this preserved paradise. Tip: Gently sloped ramps and nearby parking make beach access here a snap for Levelers. You'll find Margaritaville, Ron Jon Surf Shop, JC Penney, Target and a city of specialty shops and restaurants at Pier Park, a Simons project, in turn-of-the-century-style buildings painted in beachy pastels on the west end. It has become the post sunset hot spot but for pre-sunset, don't miss Schooners, supposedly the last local beach club on the strip. In a long-standing tradition, sunset is celebrated each evening by firing off a cannon. Pours of adult beverages are generous and fairly priced at this on-the-beach spot. Tip: The marquee tells you what time sunset occurs each day. Bayfront accommodations are a good compromise for boaters, fisherfolk, families, golfers and shellers. The condos at Reflections at Bay Point, for example, offer the amenities of golf, dining, spa and pool available to guests at Grand Residence by Marriott at Bay Point and the convenience and economy of a well-equipped kitchen without sacrificing spectacular views. Regularly scheduled expedition boats will take guests to the pristine Shell Island for a few hours or the whole day. Fishing charters are nearby as are all the oceanfront attractions as well as Publix and Winn-Dixie grocery stores. Tip: This is a great travel destination for Levelers. Steps are few and when they aren't, ramps are at hand. Even excursion boats are easily accessed. If you've always wanted to cruise on a high-end line, now's the time to get serious. According to Johanne Jainchill in today's Travel Weekly cruise edition, luxury lines are offering some remarkable deals. Crystal is offering a $2,000 per couple onboard credit on many cruises, including some starting at $3,240 per person. Seabourn has reduced some of its European cruises as much as 65 percent off the published brochure fare. A seven-day Mediterranean cruise starts at $2,999 per person - and that's inclusive, liquor and all. Silversea Cruises has taken 50 percent off of its fares to the Arctic and Antarctic as well as to Europe. SeaDream Yacht Club even has a promotion for tax accountants, a nine-day Caribbean cruise leaving San Juan April 17 priced at $2,999, considerably lower than the brochure rate of $7,400. If that works, perhaps they'll offer a break to the hard-pressed clients of those tax pros who have to pony up money to Uncle Sam. As usual, these deals are available through travel agents. If you don't have one, find a cruise specialist at www.cruising.org. Haven't hit a hill worth the name during a wonderful week of traveling in Florida and Georgia, which is reason No. 1 why these are primo Leveler destinations. Take for example Apalachicola, - Apalach, to old-timers. It's in Florida's Big Bend area at the confluence of the Apalachicola River and Bay. Tip: You Snowbirds need to detour off of I-75 for this area to see the real Florida of tranquil rivers and aqua blue bays. Better be quick, though. US 98 is fast becoming a sea level version of California's Coastal Highway 1. A few more seasons of storms and the Gulf of Mexico will be coming up under the pavement. Turn-of-the-century buildings house boutiques and book shops, hostelries and purveyors of all things maritime. That's where you wander to work off a lunch or dinner of what many consider the world's sweetest and best oysters. The fish is good, too, but Apalach is known for its oysters: 10 percent of those consumed in the nation, 90 percent of those slurped down by Floridians come from these waters. Visitors were waiting in line for a table at Apalachicola Seafood Grill, located on Market Street at the historic town's only traffic light. This popular spot claims the biggest fish sandwich and best prices but I was totally satisfied and sated at Boss Oyster House overlooking the riverfront piers on Water Street. You'd think an oyster basket would contain a lunch-sized portion but here it brimmed with TWO dozen two- and three-bite fried oysters. Plus the best cheese grits around, cole slaw and, as if you'd have room, several corn fritters. Yumm. Tip: I skimmed the shops until reaching Riverlily on Market Street. It's loaded with things you don't need and a lot more that you'll want. The Baekgaard line of colorful leather goods perfect for traveling caught my eye. Ever spend a day at the beach and return home sunburned, sand burned and exhausted? Have we got a deal for any of you lucky enough to live or be passing by near Jacksonville Beach, FL. Cruise over to the beachfront Casa Marina Hotel and Restaurant and sit down to their Sunday Brunch. Linger over the meal and by the time you've finished, your ocean-view room should be ready. Suit up and stretch out on the soft sandy beach. No need to be hasty, let your repast settle before taking to the ocean waves or beach combing for shells. Shower, nap or survey the surf from your room if you like then head for the Penthouse for a cocktail. Warning: You'll have to negotiate stairs to the Penthouse but the view and ambiance are worth it. Sleep tight then watch as the rising sun turns the ocean pearly shades you never knew existed. Enjoy a Continental breakfast and head off for home or office refreshed and glowing. Best of all, do it for $139 - room, brunch, cocktails and breakfast for two. Sounds like Leveler heaven to me. Naegelin's, the oldest bakery in Texas, is in downtown New Braunfels. The Guadalupe River provided power for a gristmill, the land proved perfect for growing cotton and until the boll weevil and Great Depression, times were good in Gruene [Green], the settlement founded by the Groene family. When the family died out so did the town except for Gruene Hall, the dance hall and saloon. It never closed and now the town, a small microcosm of turn-of-the-century buildings, is a popular weekend getaway. Old buildings have become trendy specialty shops, the Gristmill is a busy restaurant and Henry Groene Jr.'s home, next to the Hall, is now a spiffy B & B. Tip: Gruene Mansion Inn is the place to stay. If you want a touch of yesteryear with modern amenities, stay in the Inn proper, but realize the side overlooking the dance hall is noisy when the bands are playing. If you want quiet, opt for one of the newer units down by the Guadalupe River. The Inn has stairs and the newer units come on a first or second floor so insist on ground level if you need to. Walking is the only way to see the town itself, but it's small, level and doable. Follow the river to New Braunfels [BROWN-fulls] for a more in-depth look at how the area founded in 1845 by a German prince developed and thrived. History and architecture buffs will find much to enjoy but kids and the young at heart will absolutely love it. One of the main reasons - Schlitterbahn, America's No. 1 water park according to the Travel Channel. Loosely translated it means "slippery road," and with 40 separate watery attractions there's a lot of slippin' and sliding to be enjoyed. From the end of November until the first week of January, more than one million lights, an ice skating rink and shows turn it into a winter wonderland. Landa Park is 196-acres of natural beauty with a municipal golf course, tubing chute, trout fishing, arboretum, miniature golf, picnic facilities, miniature train and pools fed by Comal Springs which produces the Comal River, the shortest in the U. S.
Locals remind you of the seven museums, call their home "the town of tin ceilings" and, if you're lucky, will direct you to Henne Hardware, the state's oldest hardware store, which has everything, the town murals and Naegelin's. the oldest bakery in Texas. Come the end of October, Wurstfest, a 10-day celebration of sausage, takes over the town. Tip: Historic Walking Tour Guides of downtown are available at the Visitor Center. We lucked into a tour by raconteur and resident Wayne Rahe, which was one of those you didn't want to end. The Hill Country really shouldn't be missed. As if to make it irresistible, you can start or finish in two of the state's most enjoyable cities, Austin or San Antonio. Mountain country is usually a challenge to traveling Levelers, but on a trip to Dawson County, GA, about 50 minutes north of Atlanta, I recently found ways to get up close without arduous climbs or stairways that go on forever. Amicalola Falls State Park is the site of the tallest cascading falls east of the Mississippi River and the southern terminus of the Appalachian Trail, but Levelers can find maximum beauty with limited effort. Letting the car do the climbing for you may not be the greenest approach, but if it's that or missing out, I say go for it. Start at the bottom by following the signs to the reflecting pool where you get a view of the falls from top to almost bottom. It's a great place to let the kids drop a line. Tip: It's totally flat here and if the pond has been stocked recently (ask a ranger), expect to catch some trout. Next, hit the middle via the West Ridge trail. It's a spectacular view at the end of a quarter-mile-long trail. The trail includes a slight elevation change and a few stair steps, but its surface of recycled tires provides a soft, springy feeling underfoot. It leads to a bridge that extends over the falls. Tip: From here you can see the falls gushing from the top and cascading down and around the mountain. To get the best picture of someone with the falls as a backdrop, walk down to the fourth or fifth step on the switchback of 425 steps (aren't we feeling smug about now?) and aim back up to where your subject is posed at the corner of the walkway. Snap a photo of those steps going down while you're at it. No need to tell anyone you didn't climb them unless they ask specifically! Continue on up the West Ridge route to the overlook atop the falls for a spectacular look at how the spring-fed creek burbles quietly along until it starts its precipitous fall with a roar. Tip: A few stone steps and a path with a slight elevation change takes you to another bridge over the falls. Keep driving up and you'll reach the four-story, 56-room non-smoking lodge where the rooms are comfortable, the food is good and the view across the valley and foothills from a rocking chair on the back deck is down-right therapeutic. Best of all, you didn't have to practically cripple yourself getting there. Tip: The park also has a few campsites and 14 one- to three-bedroom fully equipped cabins. The upper cabins have fireplaces, the lower ones are by that burbling stream. The two-bedroom No. 4 would be my pick: not only is it the best designed, it's ADA compliant, all on one level with a deck and fire pit out back and a gentle slope down to the creek. Who says we Levelers can't enjoy mountain country? Taiwan rarely makes it into most travelers' Asian bucket list, which is a shame. The country is small, a little larger than Maryland, but filled with amazing sights, natural and man-made. In Taipei, the capital city, you'll find one of the world's finest museums with arguably the world's best collection of Chinese creativity. The National Palace Museum houses the best of China's cultural heritage which was rescued from invading Japanese by Chiang Kai-shek in 1931 and eventually transferred to Taiwan in 1948-49. Also one of the finest bookstores, Eslite, five stories of literature that's open 24 hours a day. Tip: Travelers from the U. S. and a number of other countries who find themselves at the Taipei airport with at least seven hours to spare between connections can take advantage of a free, visa exempt tour. Depending on the time, it might hit city highlights, nearby villages or night markets. Gourmets will want to try the world famous dumplings turned out in steamy profusion at Din Tai Fung. Tip: Levelers, this restaurant is four floors of invariably full tables and booths. Stairs are narrow and there is no elevator, but make the effort if you can. The steamed crabmeat and pork dumplings are to die for. Don't be deterred by the crowd standing around in front of this hole-in-the-wall; most are waiting for take-out orders. Night markets, the CKS Memorial Hall, temples adorned with brightly-colored Chiao-Chi pottery figures and wonderful wood and stone carvings are just a few of the city's other delights you don't want to miss. 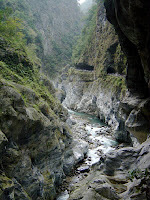 Taiwan is a mountainous country and Taroko Gorge is one of the most mountainous spots (up to 9,000 feet with 27 of the country's 100 tallest peaks) but that's no excuse for Levelers' missing it. 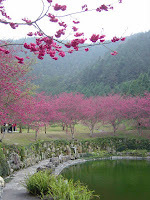 The scenery is phenomenal at Taiwan's Grand Canyon and its surrounding mountains. 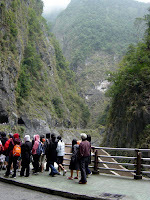 Marble lined and tree-filled with more twists than an Ocean's movie plot, Taroko will take your breath away. A 30-minute flight from Taipei to Hualien then an unforgettable 20-minute drive along the sea-hugging Chingsui Cliff will get you there. Tip: You can drive or take a motorized tour to many of the high-spots, the best of which is the Tunnel of Nine Turns. This engineering marvel will take you via a relatively flat, paved surface that winds through tunnels and along cliffs for a bird's-eye view of the gorgeous gorge carved over the centuries by the Liwu River. Don't miss it.